Gone fishin'. 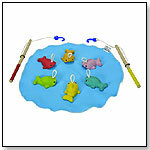 This set includes 6 colorful fish, pond-blue fabric, and 2 fishing rods. Rods can be adjusted from beginner to advanced.